Last weekend was a pretty busy one. Four islands were visited in two days. 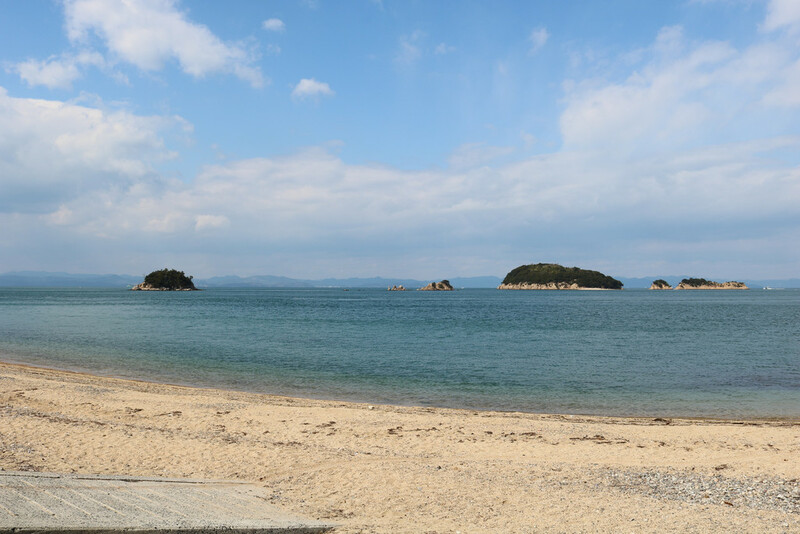 Oshima, Megijima, and Ogijima on Saturday, Shodoshima on Sunday. Believe it or not, it was only my third trip to Oshima and the first one in six years. Oshima is a very unique island, and until very recently (this month) access was very limited to outside visitors. 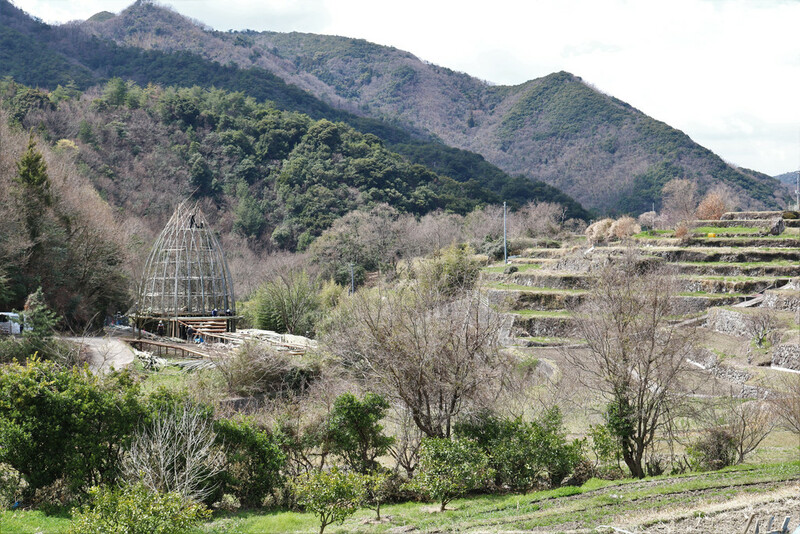 You can read more about it on my very first post about Oshima. We briefly stopped at Megijima next (we were on a chartered boat so no need to return to Takamatsu) to see three new art sites. 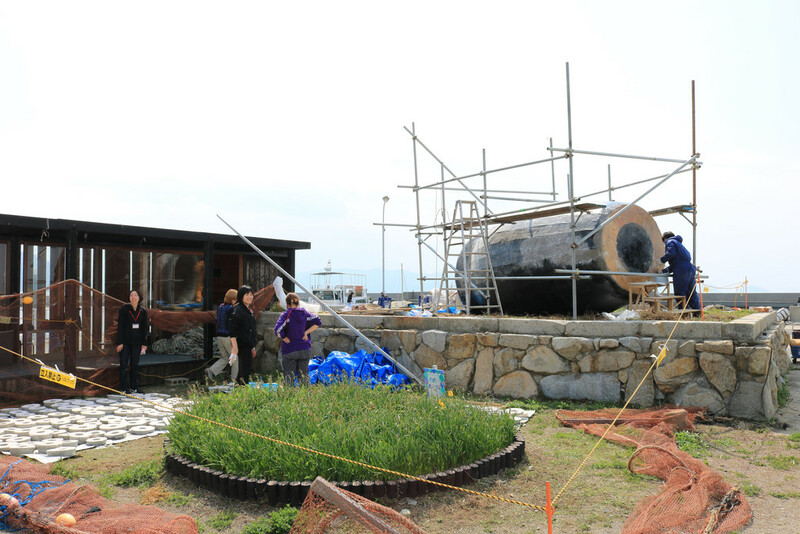 If you attended the Setouchi Triennale 2016, you will have recognized the site for Feel Feel Bonsai. 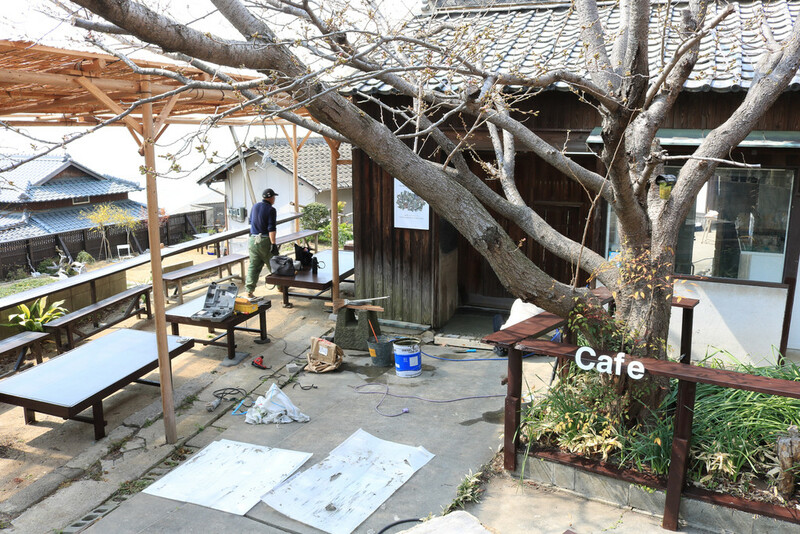 This time the place will be called Bonsai Deepening Roots and it’s done by the same people, that is Setouchi Cogeiz for the design of the site and Masashi Hirao for the bonsai. 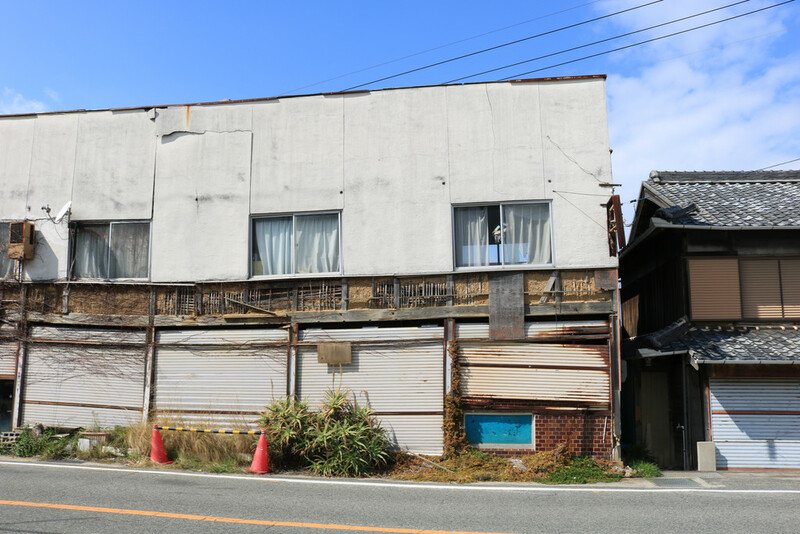 This former “beach house” and hostel will become the site for the Little Shops on the Island project that is going to house up to eight installations (some of them may be outdoors). 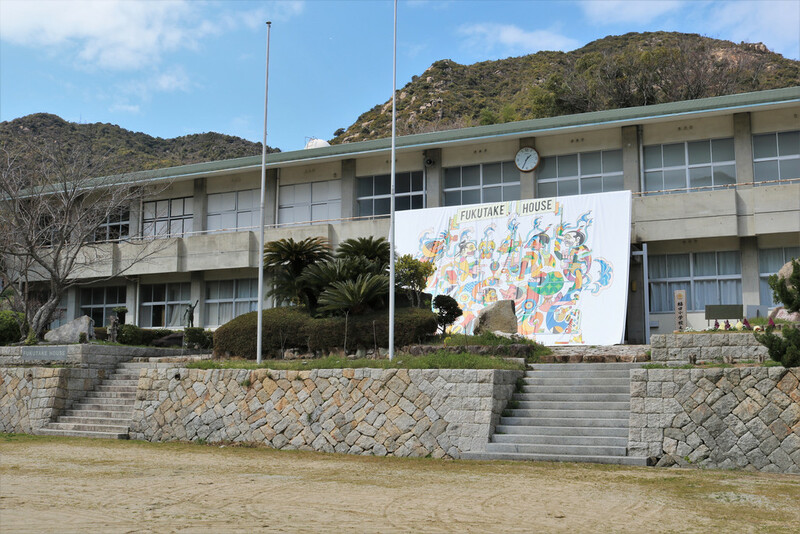 The odd thing is that when I first arrived in Takamatsu, I taught in a local high school for a little while and this place was owned by the mother of one of my favorite students there. The place “mysteriously” closed about three or four years ago, and I have no idea why, as I didn’t teach at the high school anymore. Last time I heard about the student, she was in college in Fukuoka, where she will most likely start her last year this April. In 2016 it was Ogre’s House number three by Chaos Lounge (you can see what it looked like then on this post). This year, it’s going to be House-Boat by Kouryou (pronounced Kohryoh), who I think is a member of Chaos Lounge, or has worked with them. Right off the boat, we were met with the reason why I went to Ogijima (too early) last week. That is Team Ogi‘s new art. It doesn’t have a name in English yet, but in Japanese, it’s Tako-tsuboru which could be translated by “trapping octopus“. Oshima-san (in red) and the rest of Team Ogi were hard at work. I just said hello, as they didn’t have time to stop much to chat. Once again, we went to various sites where there will be new art (it was the purpose of this trip after all). Takeshi Kawashima and Dream Friends Gallery is getting renovated before the new work of art, The Space Flower – Dance – Ring gets installed. We stopped in front of the building where Sarah Westphal will have her installation too. It’s the old post office, but there is nothing to photograph really. So, in the meantime, I invite you to read the interview I made with her if you haven’t yet. 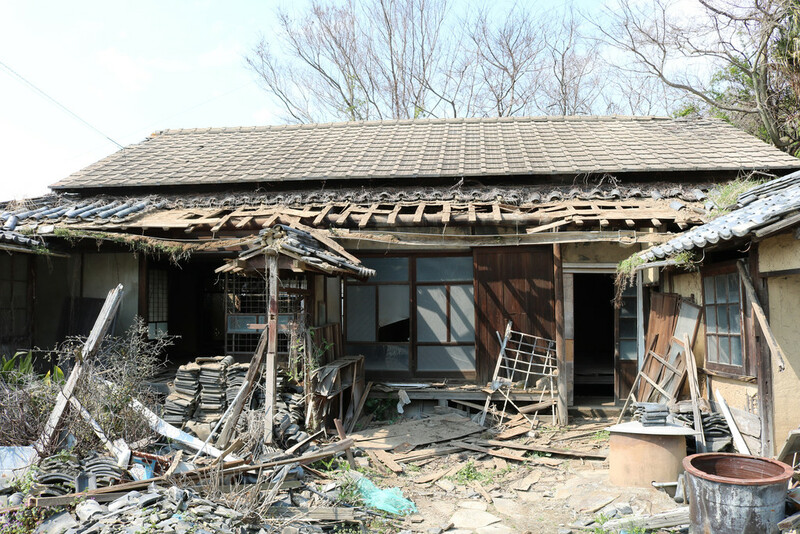 This abandoned house, right behind Memory Bottle, kinda is the “original abandoned house on Ogijima” for me, probably because it’s the first one I photographed, during one of my very first visits to the island. 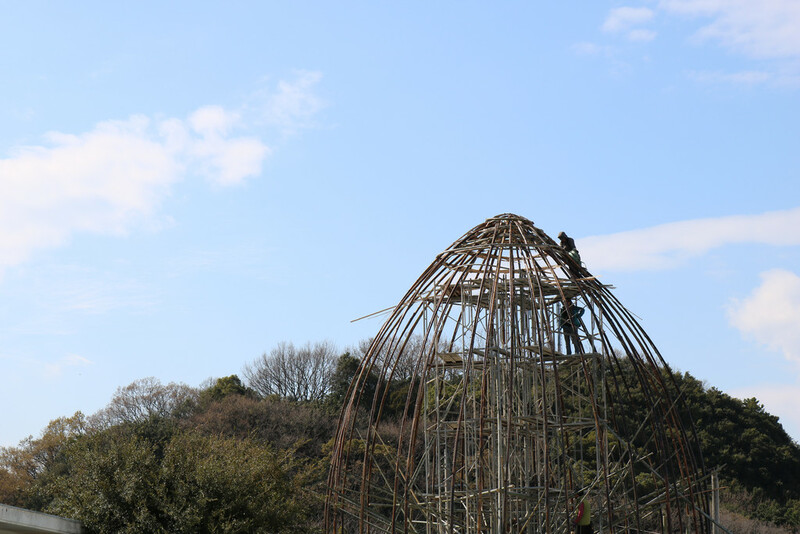 It’s soon (this summer) will become an art installation too, by Toshikatsu Endo. The name should be something like Trieb House. I gotta admit I’m almost sad that it’s being turned into an artwork. I really love it the way it is now and kinda hoped it would stay this way forever (or until it collapses, which is the more likely option). Also, while I didn’t see him (well, I may have seen his silhouette in the distance), Gregor Schneider arrived on Ogijima shortly before we left in order to start planning his future artwork, and if I understood right it should be quite big, and I’m still not sure how it will fit where it’s supposed to be located (that is the street between Sea Vine and the road to the lighthouse). We’ll see – it shouldn’t be ready before the summer though. And as the tour went much faster than “planned” (I mean, it was planned to go faster than planned in a way), I had plenty of time to go visit my friends at the library and at Damonte & Co. 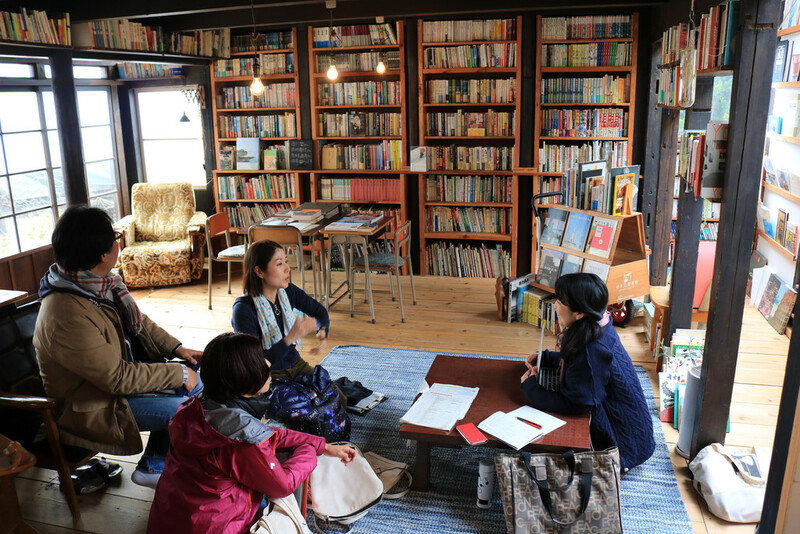 Some of my co-travelers had the same idea (because the Library and Damonte & Co are the “in” places on Ogijima nowadays). 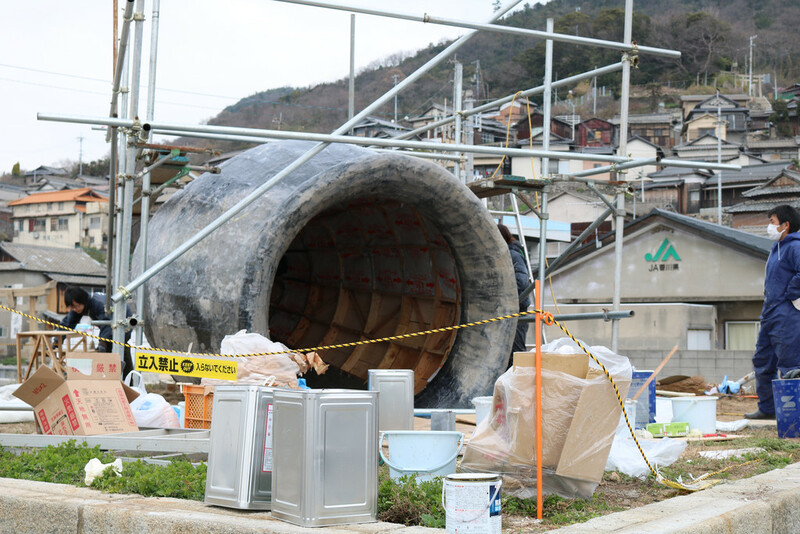 We were in Hitoyama to check on a new artwork there. Fluire by Giacomo Zaganelli. Well, a bit like the cherry blossoms, we’ll have to wait a little bit to see anything. 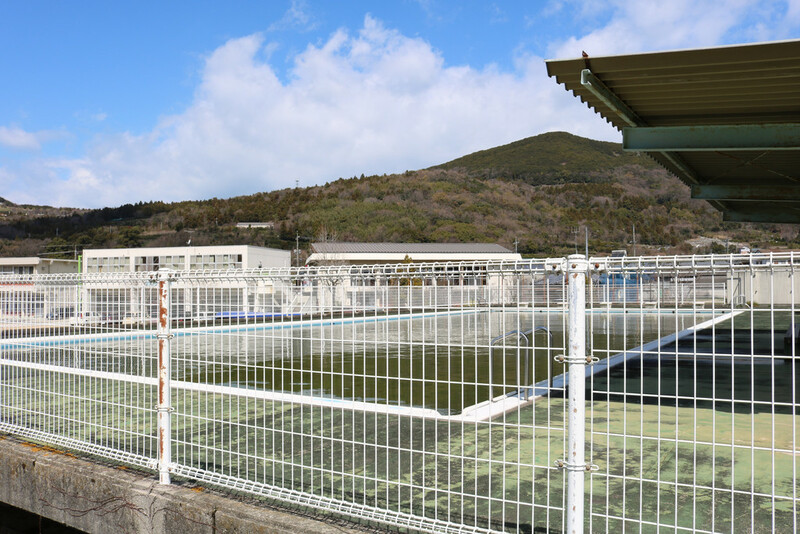 I’m not sure what the artwork is supposed to look like, but I know it’s going to be in or around this swimming pool (that was part of the Hitoyama elementary school, now closed). As you can see, there’s nothing yet. 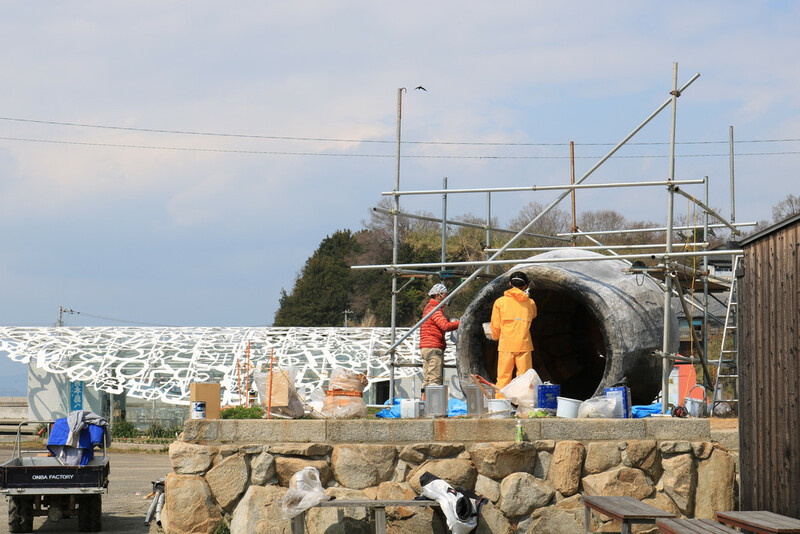 That’s one of the interesting things about the Setouchi Triennale during the weeks that precede it; seeing the advancement (or lack thereof) of what’s happening on site. Now, the fact that some locations have nothing yet doesn’t mean anything. The Triennale is still a month away, and not all artists can stay for weeks on site. Not all artists need to either. 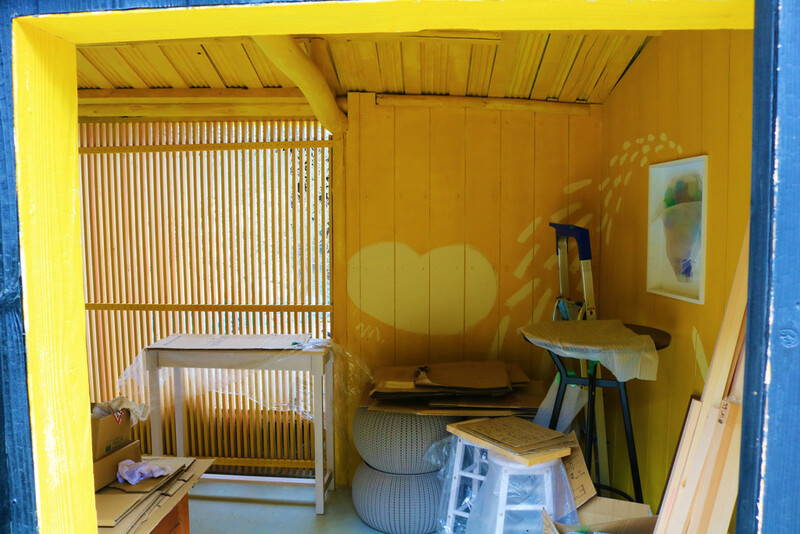 And while I love when artists are indeed on site, we have to understand that some artists (especially the ones from the other side of the planet) will do their work at home and only bring it and install it on the days preceding the start of the festival. 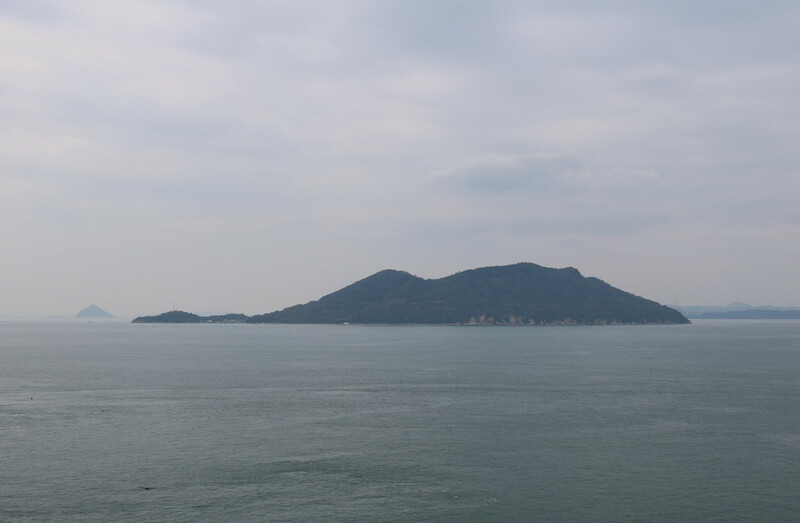 Masato Saito’s Shishigaki Island is still around in the distance. 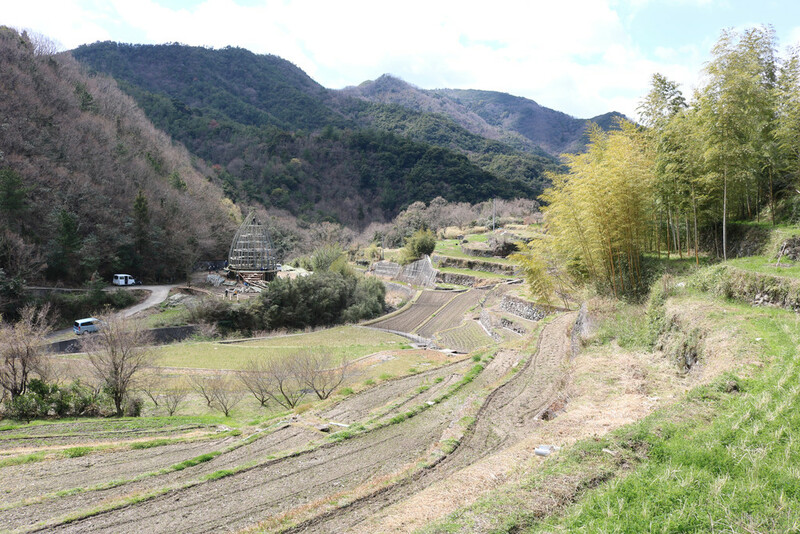 This valley between Hitoyama and Nakayama is one of my favorite spots on Shodoshima. 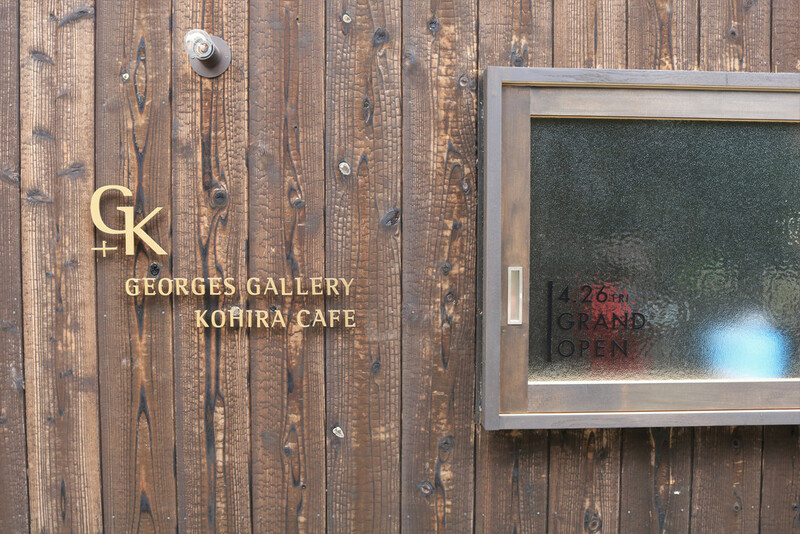 Next stop, Nakayama, where the next artist can’t afford to install his art at the last minute. 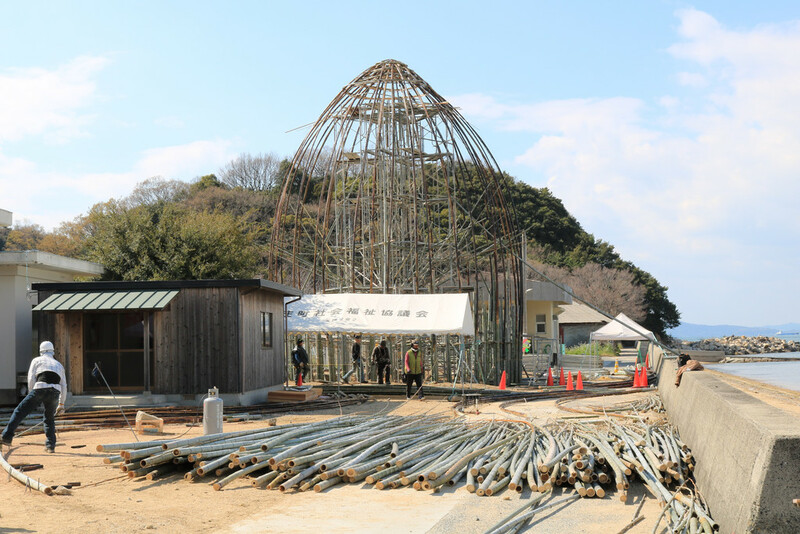 I’m talking about Wang Wen-Chich, who has started the fourth iteration of his giant bamboo house, always one of the most popular artworks of the Setouchi Triennale. 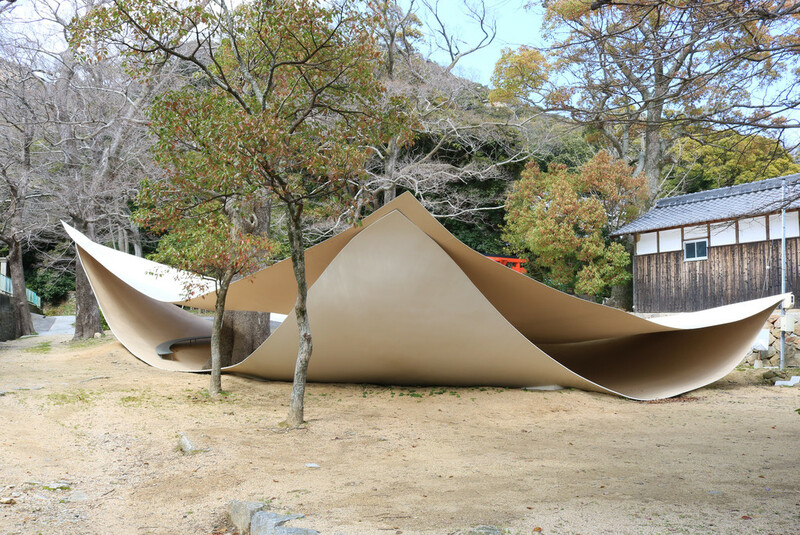 This time it is called Love in Shodoshima and should more or less look like a seashell (but sometimes the final result is quite different from the original plan, so we’ll see). As you can see, it doesn’t exactly look like a seashell just yet. Not a new art, but I’m not sure I’ve ever shown it here. 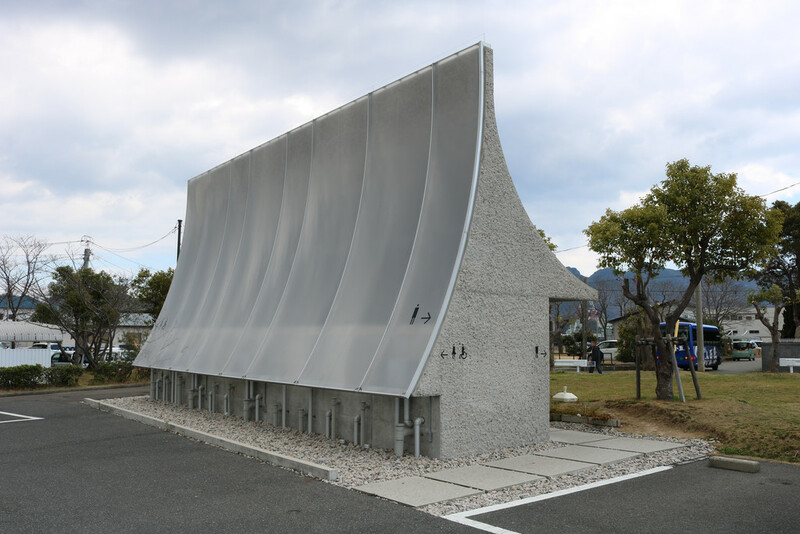 It is a public toilet in Kusakabe Port, but it’s also a Setouchi Triennale artwork: Stone Island’s Stone by Hideyuki Nakayama Architecture. 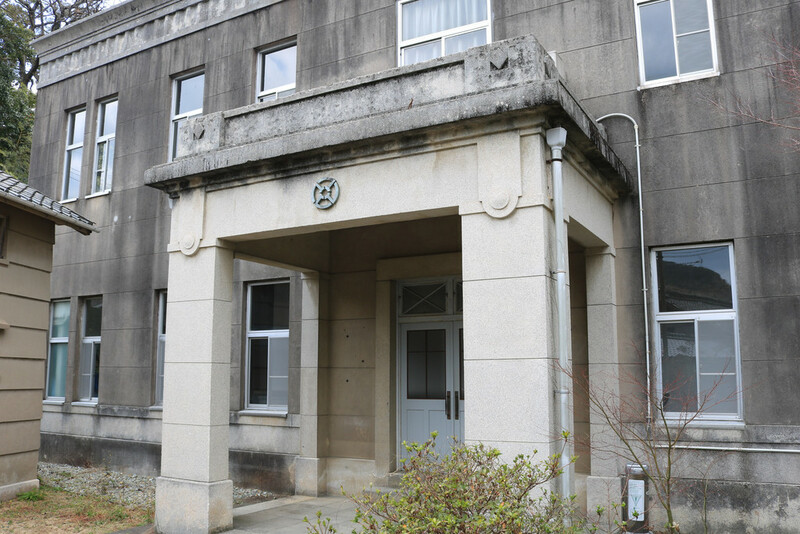 This building is a former soy sauce cooperative office. It housed one of my favorite artworks of 2013 and one I didn’t really care for in 2016. This year, it’s going to house The Silent Room by Hans Op de Beeck. 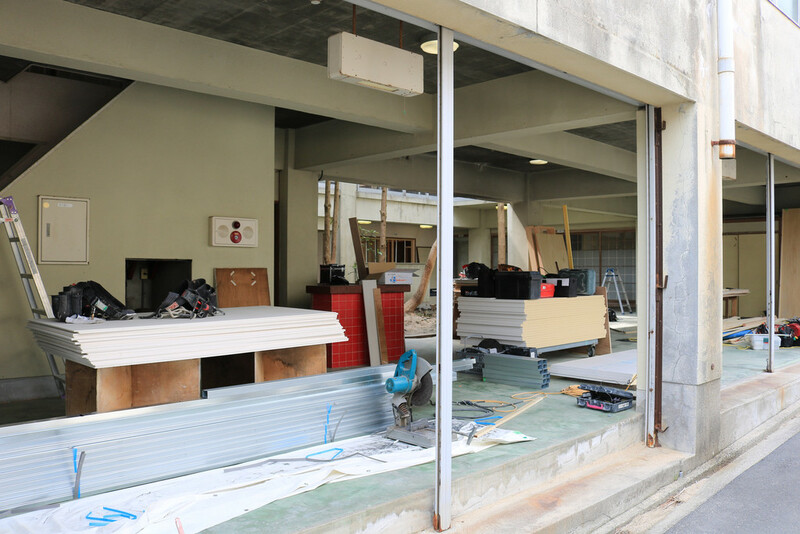 It looks like it will also be a café. Nice. 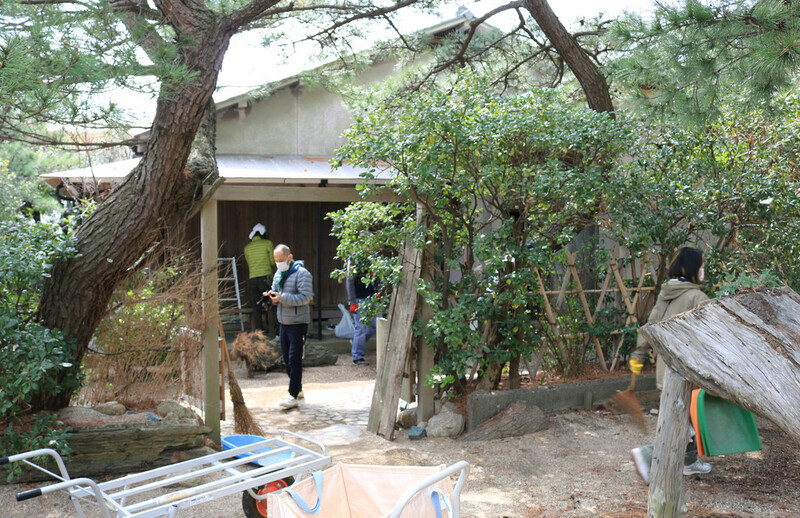 Could it be a new permanent art gallery in Umaki? 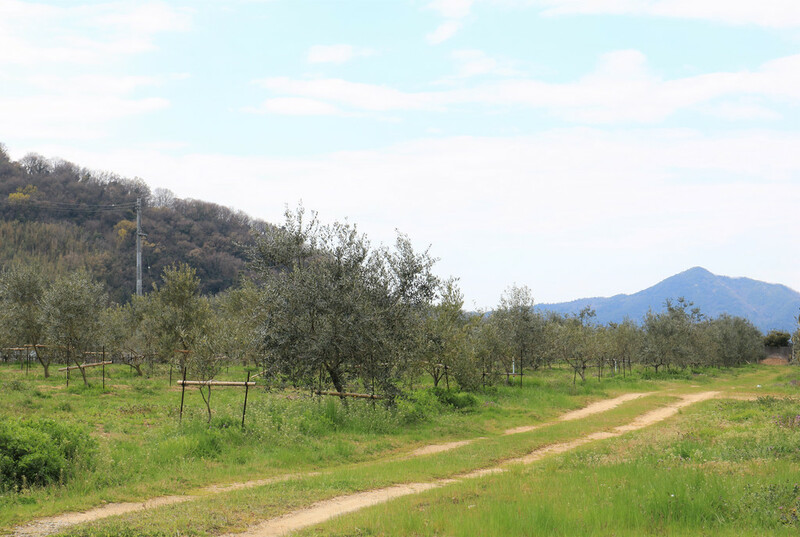 In Noma, there is this small olive orchard on a big rectangle of reclaimed land. It will also be the location for Rosa Barba’s Fosse d’Orchestre / White Museum. There will be a certain number of exhibits inside. 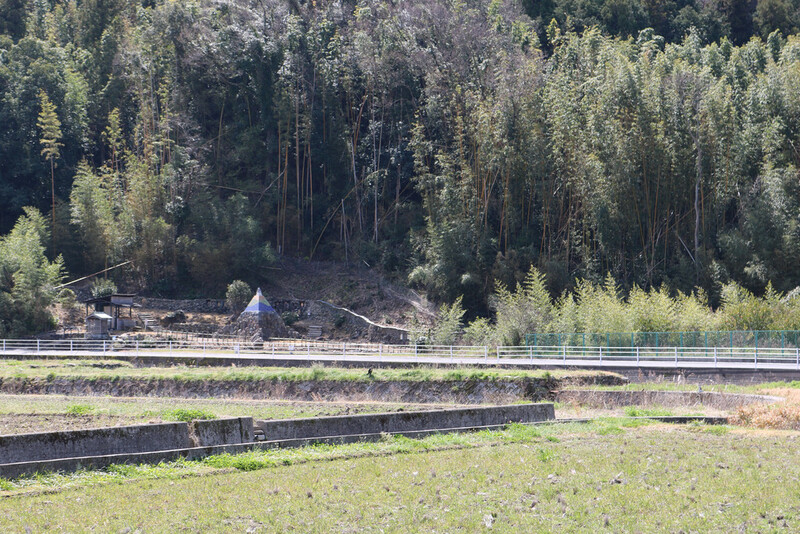 Lin Shuen-Long‘s newest work for the Triennale: Beyond the Border – Wave. 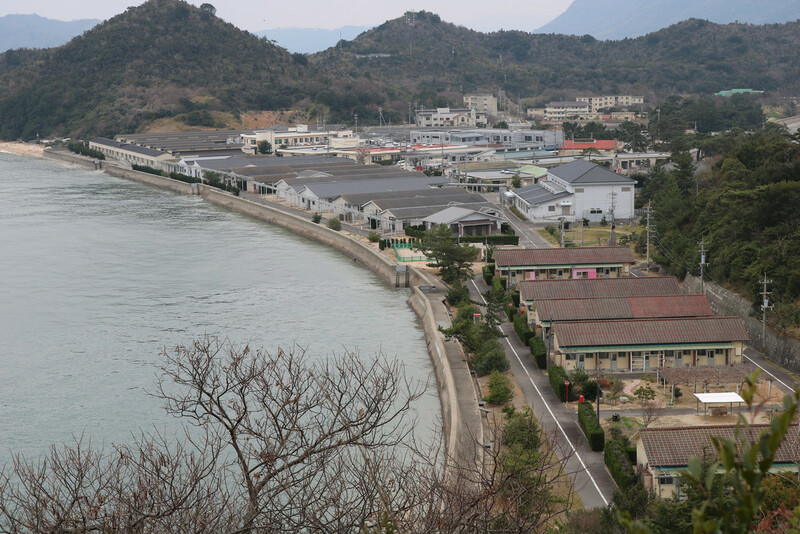 While looking very different from its predecessors, it is part of his Beyond the Border series, which started with the Ocean (first on Teshima in 2013, and it moved to Takamatsu in 2016 where it still stands), and was continued with Tide in 2016 on the same spot in Obe. Beyond the Border – Tide was one of the most beautiful and moving artworks of 2016, and also being a big fan of Beyond the Border – the Ocean, I’m really looking forward to this new one. 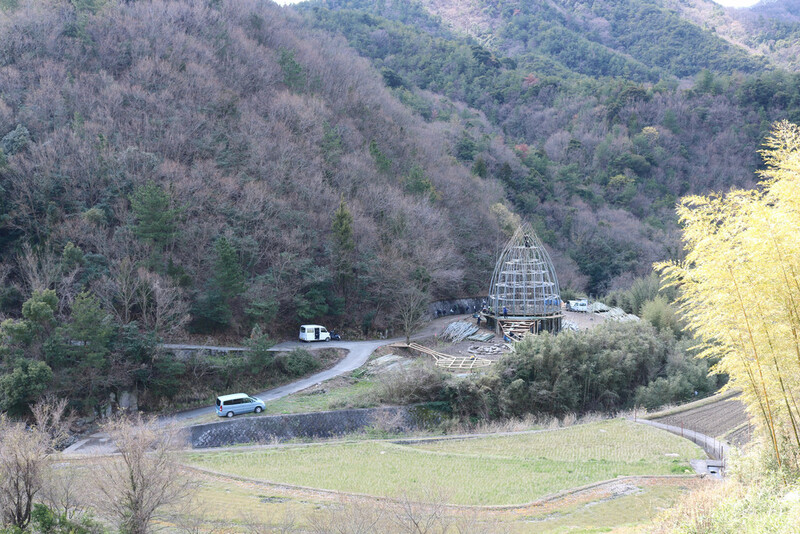 Interestingly, at the moment, both this construction and Wang Wen-Chih’s really look alike, but the finished structures should look very different from each other (if I am to believe the concept art of this one, it should be a gigantic – two or three times the size of this current structure – spiky sphere, like a giant sea urchin and it should extend into the water. In other words, I can’t wait. If you’re curious, Lin Shuen-Long is quite active on Facebook where he posts updates several times a week. That’s all for those two trips over the weekend. 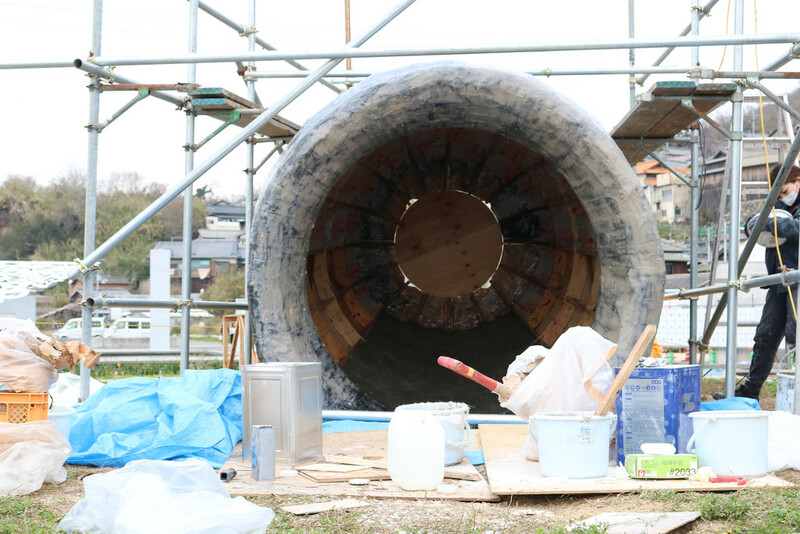 The Setouchi Triennale 2019 is exactly one month away. I’ll try to go to a few more sites before it starts (not making any promises, although I’m almost sure I’ll at least go to Ogijima). Oh, wait… I didn’t tell you the reason for these trips, as well as the ones last November. I guess I can now. 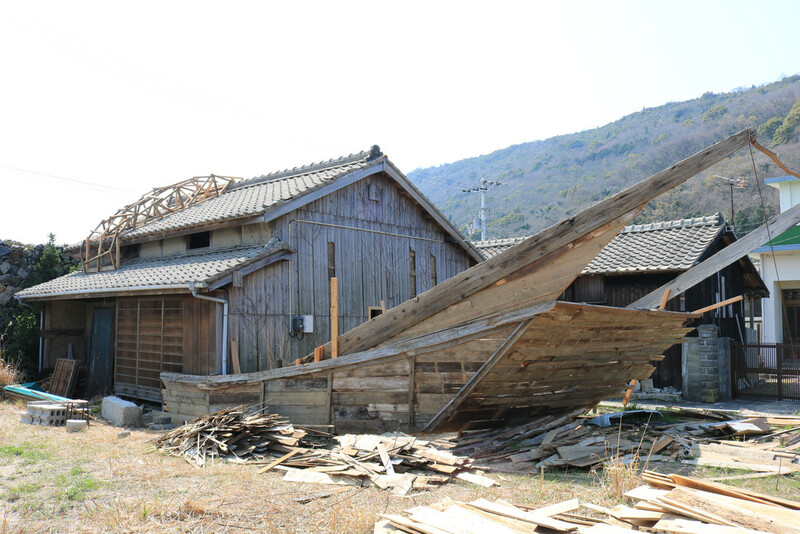 So, you know those official tours that the Setouchi Triennale is organizing this year, right? Well, I’ll be one of the official guides. More information very soon. Stay tuned. Boy, you are making me want to visit Oshima again even though I went 3 years ago. Do you think it will be worth it? 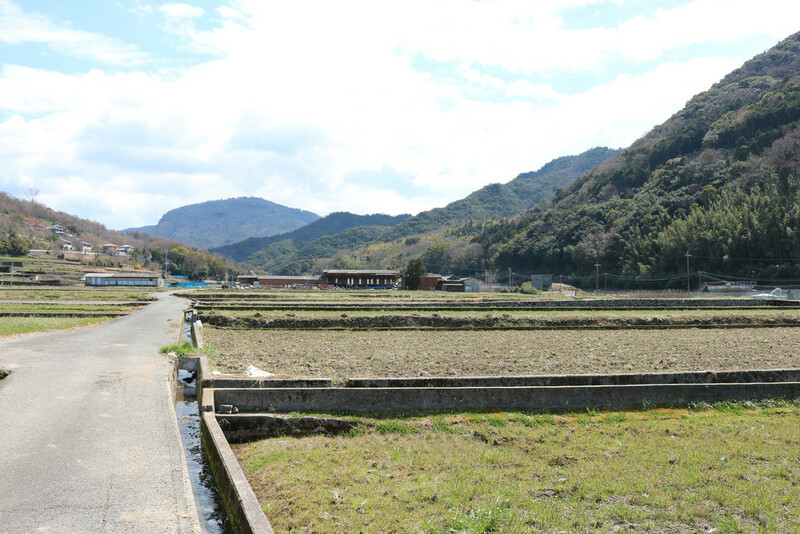 Also, Megijima is looking very interesting. Seems like an entire day rather than half a day that I usually spend. Hope I have time to visit them all. Current plan, probably have to skip Teshima due to time constraints. Yes, I think it’s worth going to Oshima. There seems to be a lot of new art this year according to the website (I haven’t seen it, just that path in the forest). Also, the island is opening up and is not a “forbidden island” anymore. There’s even a regular ferry that started running this month (I mean, it’s the regular boat, but now it’s open to everyone all the time. Megijima will be interesting this year. Not sure if one full day on the island is necessary (no new art at the cave, no art in Nishiura), but who knows? It’ll all depend on how much time the “Little Shops” require. If they’re very fun/interesting, yes, one full day may be an option. 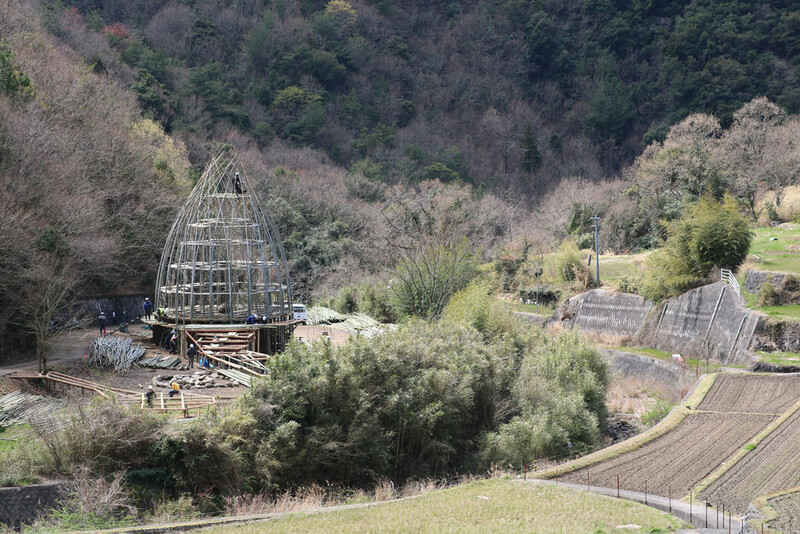 It’s not useful to any Triennale visitor but just from the photograph, the building that’s going to house The Silent Room by Hans Op de Beeck looks like the building used in the Japanese horror flick “One Cut of the Dead”. Have you seen it David? The film is a zombie comedy that is brilliantly crafted in a slapstick way and I can’t recommend it highly enough for non-zombie film fans. For Triennale visitors, if you can watch it before visiting, enjoy it as a very different cultural immersion. I have heard of the movie, but I haven’t seen it. Do you think it’s the same building, or does it just remind you of it? (I don’t think it was shot on Shodoshima, or I would probably have heard about it, but who knows, contrarily to popular belief, I don’t know everything that is taking place on the islands 😉 ). I can’t remember where it was shot and couldn’t find the info but the real location might just have been somewhere outside Greater Tokyo. But the similarity was strong for me. The film’s got lots of laughs, especially if you’re interested in film production and behind the camera action. I can’t say more without giving the plot away! A friend of mine who loves weird movies has told me about it, I’ll give it a shot if I find it. 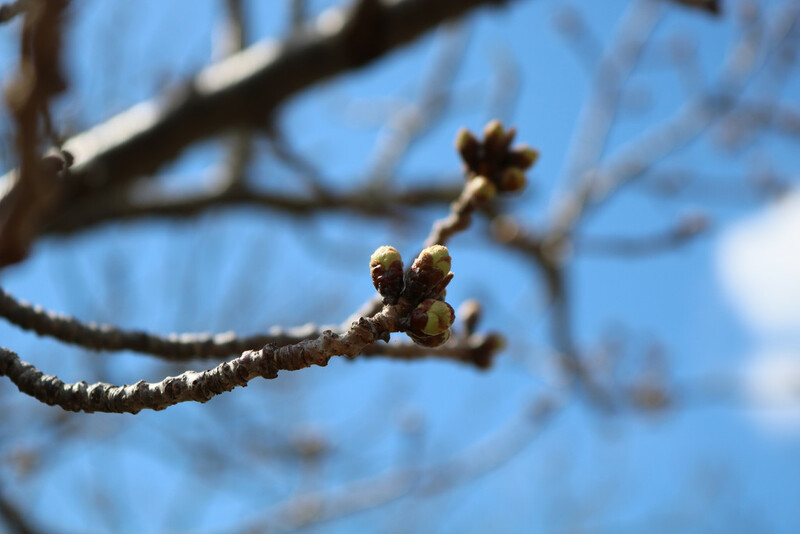 Next post Has Cherry Blossom Season Started?